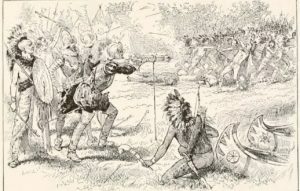 The warfare between the Iroquois and the Hurons, in which Champlain’s expedition of 1615 was only an incident, came to a sudden end in the middle of the century . In 1649, while Charles the First was being executed in England, the Iroquois determined to close in on Simcoe County with their entire force. The chief Huron towns were stormed. The inhabitants were butchered or taken captive. Three of the Jesuit Fathers, Daniel, Brebeuf and Lalement, suffered martyrdom. The Iroquois campaigns of 1649-50 practically exterminated the Huron race. For nearly a century the Iroquois roamed unhindered over the deserted country of the Hurons. Retribution, though long delayed, overtook the Iroquois at last. The avengers of the Huron nation were the Mississagas, an Algonquin tribe from near Sault Ste. Marie, who trace their lineage back to the Shawnees of Kentucky. Early in the 18th century, hunting parties of the Mississagas started drifting down over central and western Ontario. Here they were set upon and massacred by the Iroquois. 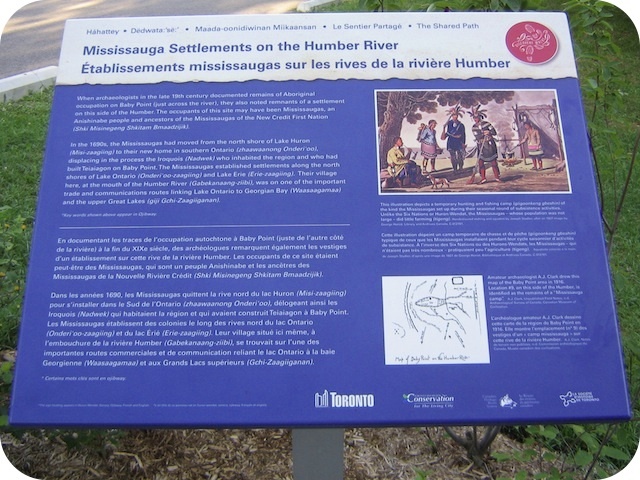 The outcome was a Mississauga council of war in 1740 and the launching of a great punitive expedition against the enemy. 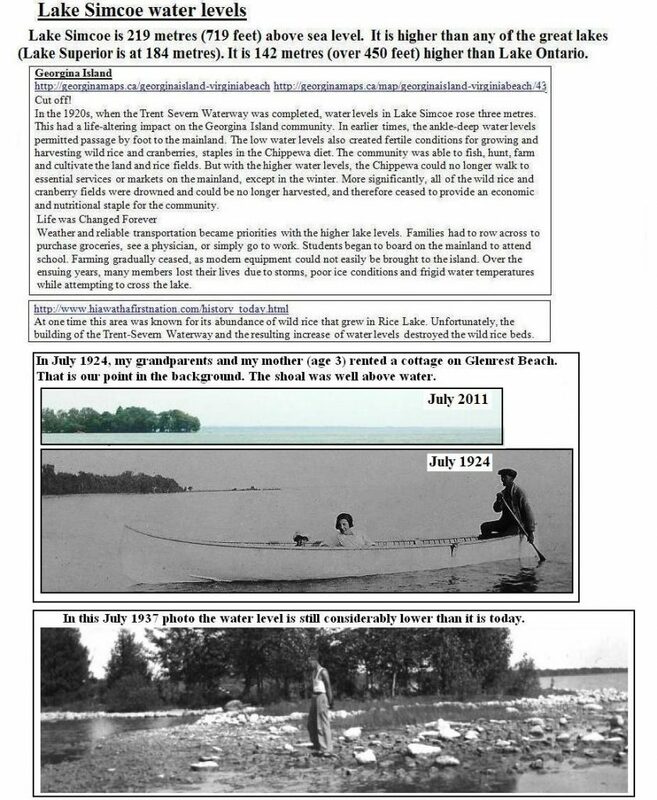 The story of that grand foray, as handed down in Mississaga tradition, makes stirring reading. the Mississauga expedition actually crossed into New York State, besieged the Iroquois in their villages there, and enforced a treaty by which the Mississagas were admitted as an additional tribe in the Iroquois Confederacy. A general migration from their northern home into the land was the immediate result of this season of Mississaga warfare. From 1746 to 1750 they fought with the Iroquois against the French, but suffered reverses and withdrew from the Confederacy. 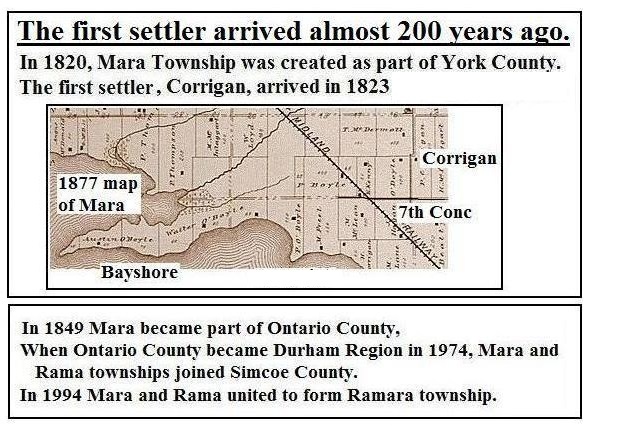 However, they continued to occupy Southern Ontario. for the first time in 150 years, the area was again dotted with villages, though not as thickly as in Huron times. As noted earlier, the Mississagas are an Algonquin tribe.